A bunch of explosions are tearing apart India. The Commissioner of Police (Murad) and his men are stumped as to who is responsible. But we aren’t! We meet Scorpion, who is being paid by the agent of an *unnamed* enemy country. Since the people actually talking say “microdots” and it makes more sense, that’s what I’ll call them too. Scorpion somehow knows about the microdots too: he is conveniently omniscient, although his thugs are remarkably ineffectual. He sends Lopez and Joe (Shetty) to Twist Music & Photo Shop, whose owner (Bhagwan Sinha) is the informant. 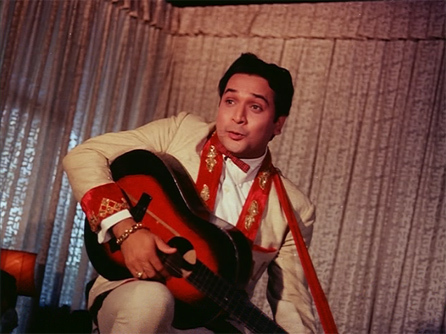 As he’s being threatened by the villains, Vicky (Biswajeet—yes, poor maligned Biswajeet) arrives to collect his guitar. 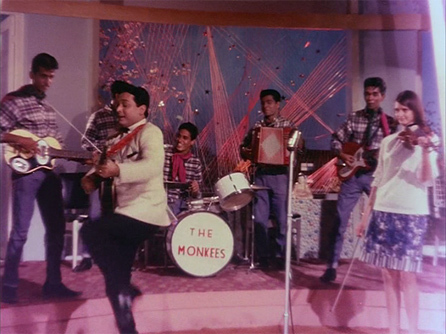 As the villains watch from the back room (their guns trained on him), the music store owner slips the paper containing the microdots inside Vicky’s guitar, who takes it away with him. But he quickly confesses all to Lopez and Joe, who go after Vicky immediately. Vicky is a singer and guitar player at a hotel nightclub. He works with Nancy (Helen). Hooray! OP Nayyar wrote the songs; this one (“One Two Three Baby”) is quite Helen-worthy, although I don’t think most of them are up to his usual standards. 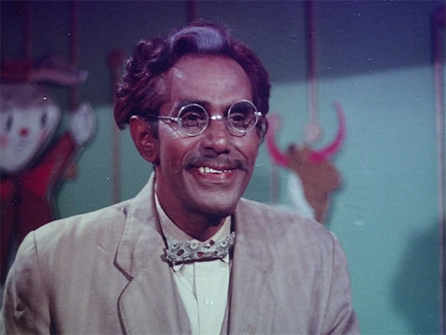 [Side note: Biswajeet was tolerable in this film! Quite lively! 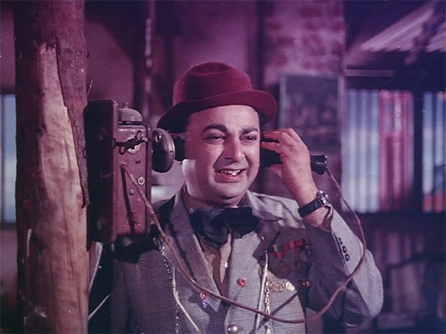 He still reminds me of Peewee Herman, but tempered a bit here—more as if he were Peewee and Rishi Kapoor’s love child. Scorpion’s thugs break into Vicky’s room afterwards and try to get the guitar from him. It was a gift from his late father, so he refuses to give it up, and manages to escape. They corner him again a couple of days later, and he gets away again, this time by hopping aboard a train where he meets another escapee, Roma (Babita). Roma’s father is a wealthy businessman and she is his only child—so he’s very strict with her and she has run away from home. Roma and Vicky sing a song by a waterfall and are saved from having to walk back to the city by a good Samaritan named Jani Bhai. Jani’s car has special skills, like boxing and shooting paintballs out of its exhaust pipes. Jani himself is an eccentric inventor. See? Chitty Chitty Bang Bang! He and Vicky become best buddies in the filmi manner, and he helps Vicky get a job at the hotel where Roma has decided to stay. Vicky sings a country-western song while his audience does the twist. I love the tall white girl with the fiddle. Roma arrives looking glam in a silver lamé saree. Vicky is thrilled to see her, and after the song, she invites Vicky to stay in her room with her! I’m astonished, although it’s of course completely chaste. Omniscient Scorpion has discovered that Vicky is at the hotel; luckily, his henchwoman Julie works there too. She delivers a suitcase to Vicky/Roma’s room, which contains a hidden camera. Keeping tabs on Vicky’s whereabouts doesn’t really help Scorpion’s useless henchmen though; with Jani’s help (and the car’s) he keeps eluding them. Time to send in the big guns! Nancy reappears, and manages to insert herself between Vicky and Roma, creating a misunderstanding. When Roma boots Vicky out, Nancy takes him home. 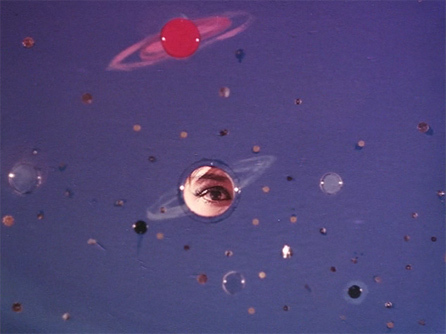 From the bathroom, she spies on Vicky through a hole in her medicine cabinet (on Vicky’s side the hole is cleverly concealed in an outer space mural). He’s sitting comfortably in a leather chair. Indecision and sorrow flicker across Nancy’s face before she pushes a switch which sticks a knife blade out of the back of the chair. Luckily, Vicky leans forward just as it makes its lethal entry, and fortuitously is kept from leaning back again. He catches on to Nancy’s treachery pretty quickly when a villain with a hook for a hand appears and tries to kill him (but is defeated fairly easily). Nancy ends up impaled on her own chair. Before she dies, she tells him that she was forced to work for Scorpion because he’s holding her father prisoner. This storyline never goes anywhere and I’m not sure why it’s even introduced in the first place. But Nancy—my Helen!—is dead. After that, I kind of lose interest. The story is just idiotic, and though there are some bright moments—as when Biswajeet and Babita do a mujra in drag (the other song I like: “Kajra Mohabbatwala”)—I’m just not invested. If you want to find out who Scorpion is and whether Vicky and Roma get it together, by all means watch it. Lower your Manmohan Desai expectations (although he wrote the screenplay too, it’s almost like he just never showed up to be part of the film), and the FF button can help a lot too. And finally, who is the guy playing Jani? Help me, smart readers! Posted on October 31, 2008 at 9:56 am in Excellent Use of Helen, Hindi movies	| RSS feed You can skip to the end and leave a reply. Wow, really? This isn’t good? 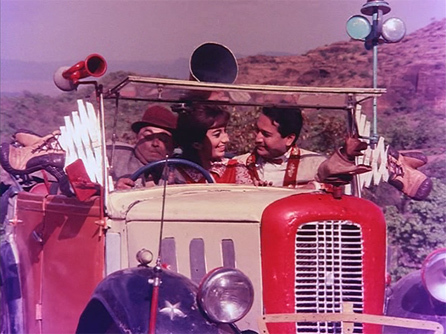 Okay, I’ll take your word for it, despite it being almost impossible for me to resist any espionage-themed 1960s Bollywood movie, especially one that features a magic car. 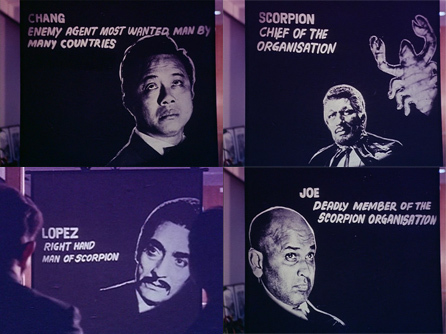 By the way, regarding the second picture down, in keeping with current popular linguistic trends, shouldn’t it be “Joe the Deadly Member of the Scorpion Organization”? Ha ha, Todd! I thought of you while I was watching it. It was a sad disappointment, but mostly that’s because my expectations were pretty high. There were some good moments…you might mine more gold out of it than I could! lol at “as if he were Peewee and Rishi Kapoor’s love child” – it does look it! Saw this one years ago (as a kid) and I remember liking it a lot. But back then I thought Biswajit was cute, too – kids have no taste!… I still like the songs though – Kajra mohabbat waala, Aao huzoor tumko, Laakhon hain yahaan and Aankhon mein qayamat ke kaajal are all fun though I do miss Rafi’s voice. But there is no Rafi in this film but Mahendra Kapoor. For some reason the songs didn’t connect with me (except the two dances). The whole thing just had so much potential and I just felt let down by the end. Perhaps it will be one of those that I watch again some day and say: “How could I not have liked this one???!! !” Here’s a secret: Yaadon Ki Baraat was one of those. I hated it the first time I saw it, now it’s one of my favorites. The MONKEES? Ha ha ha! I really and shamefully adore biswajeet and his parents rishi and peewee! I watched this movie when i was 8, it was a good mix for kiddies like me, then i watched as a 17 year old, and saw the masala greatness of this movie! And the wonderful monkees and helen are here, i must have this! Does this fit in with the Horror masala state that i created?? No, it’s just dull not horror-inducing :-) I confess I cannot watch horror movies of any kind, they scare me no matter how cheesy they are. This one just gets tiresome and it doesn’t have *enough* masala oomph! to keep me interested. Biswajeet was pretty fun though, livelier than I’ve seen him elsewhere. Rishi and Peewee would be proud. Ohhh- anyone but Biswajeet- he is just so…- not bad, but just not exciting somehow:S If only they had picked Dharam- he rocked spy-type thrillers! I’ve seen this a couple of times – mostly as a kid – and remember being sort of ambivalent about it. I liked the music (esp. Laakhon hain yahaan dilwaale, Kajra mohabbatwala; and Aao huzoor tumko), but neither Biswajeet nor Babita rank among my favourites. The only bits that stuck with me were Biswajeet in drag, and the fight at the climax – Shetty and Biswajeet and lots of mud! Oooh, Kahin Din Kahin Raat actually sounds like a winner to me! 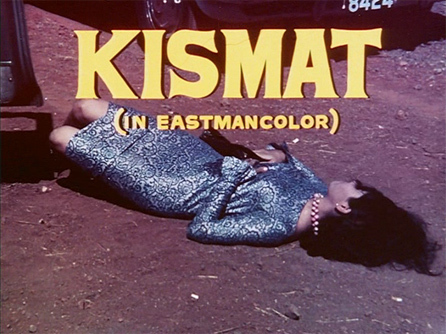 Kismat was neither bad nor incoherent, just kind of tiresome. It went on too long and didn’t have enough craziness (either that, or my craziness requirements are becoming dangerously high)…poisoned fingernails and Parisian bronze be-wigged Biswajeet, though, I need to see! You must – it’s utterly ludicrous! The heroine’s a little known actress called Sapna (well, this was the only film of hers I’ve come across): pretty but wooden. 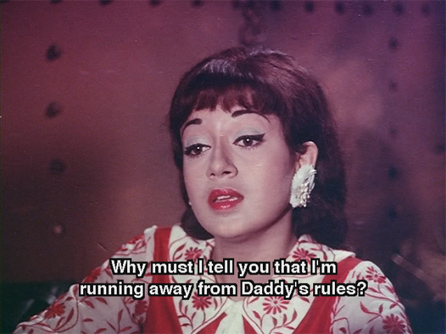 An over the hill but still vampish Nadira plays her evil stepmother – and Pran’s mistress. A scream of a movie, really. :-) And yes, Helen’s in it too, oomph all the way. Biswajeet movies had good songs! So do most of Manmohan Desai’s films, and OP Nayyar was no slouch at composing. I was just disappointed in the songs from this, although I will probably try listening to them again. I completely disagree on this one. What makes Biswajeet fun to watch is that does look like a more suave pee wee but is completely oblivious and carries on with being a hoti. His dance steps are pretty fun too. This movie’s songs very good ,I really like the one where the gori girls in the night club are staring at Buswjeeet while he sings dunya koi dil wali but pyar nae milta. The mujra is also ver good. This movie has its moments and Babita looks ravishing! Good songs by almost all composers who scored for his movies like OP,SJ, Chitragupt, LP etc really helped him a lot and he also enacted them well. I agree with KB that Biswajeet enacted well most of those scintillating songs filmed on him. He was not a bad actor either and did fairly well in keeping with those ’60s trends in fashion, acting, music, drama, and dancing. This film had 3 great songs – ‘laakhon hain yahaan’, ‘aao huzoor tumko’, and ‘kajra mohabbat waala’, and all three songs were filmed nicely. 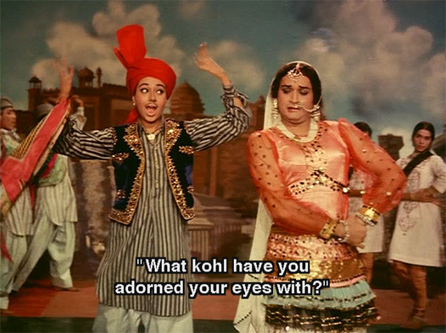 I particularly liked performance and dancing of the lead pair in ‘kajra mohabbat waala’. I still greatly enjoy watching this song. The film was pretty fast-paced (not surprising because M Desai directed it), and I enjoyed it. 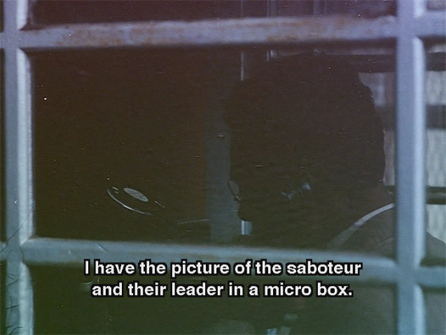 It’s Kamal Mehra, the producer.